They will blow your mind. If you’re vegan, you are always looking for unique dishes to create in the kitchen. Thanks to BuzzFeed Oz’s video and The Minimalist Baker , my vegan boyfriend and I were able to make this incredible dish [and it only took 30mins]. Now why would a vegan try to re-create a pulled pork sandwich, you’d ask? Because we like to get creative in the kitchen as well and who doesn’t love a good bbq sandwich 🙂 In this recipe I didn’t expect it to taste like meat, but give it a similar texture with all the sweet bbq goodness mixed in. 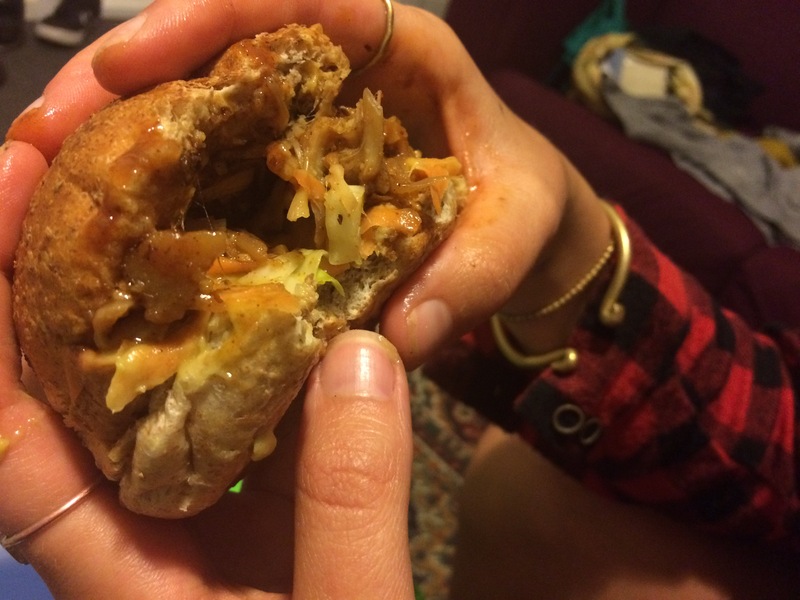 Throw on some ‘slaw and bam you have yourself a vegan bbq pulled “pork” sandwich. What is the secret veggie/fruit that gives the shredded texture? JACKFRUIT! Whoever figured this out is genius and I personally thank them for this finding. 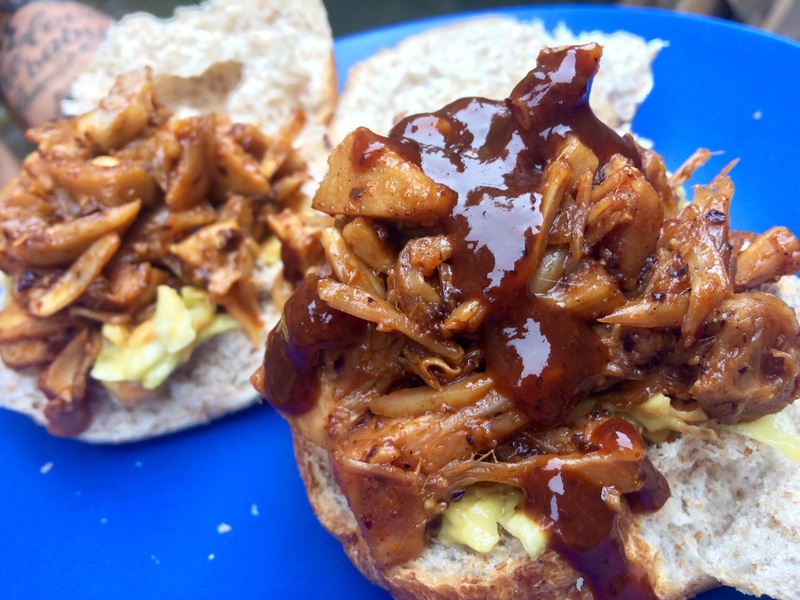 Here’s how to re-create this popular bbq meat sammy, vegan style. And don’t forget 4-6 vegan buns for serving! Start off by chopping off the core of the jackfruit. 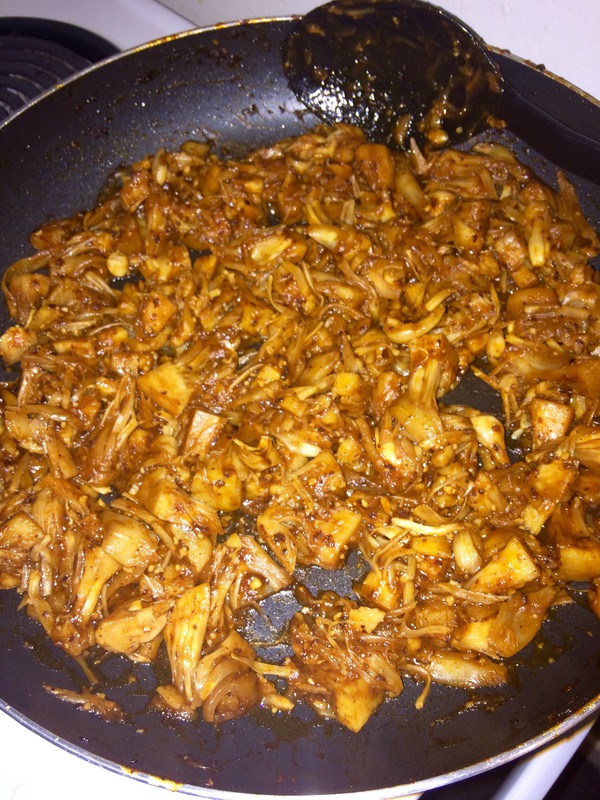 Mix the bbq seasoning in a bowl then add jackfruit making sure it’s covered in the seasoning as seen as below. Heat a large skillet, add 2 Tbsp of olive oil, then add jackfruit. Toss and cook for 3 mins. Then add bbq sauce along with a little water. Reduce heat to low-med and cook for about 20-35mins, occasionally stirring. You may cover with a lid, but if not watch the sauce and add more water if needed. Now it’s time to SHRED! Use two forks to shred that jackfruit into a pulled “pork” texture. And it will end up like this. While the jackfruit is cooking you can start on your ‘slaw. Whisk the avocado, salt/pepper, lemon juice, maple syrup, and a bit of water into a creamy mix. Then add cabbage and carrots and mix well. Store in fridge until bbq jackfruit is ready. Once the jackfruit is shredded, it’s time to make sandwiches! Slop some ‘slaw on the bottom, top with yummy bbq jackfruit, and smother your favorite bbq sauce on top. Get ready for your mouth to love you!